The low and high yesterday was 22 degrees. I guess there is something to be said for constants. So last night was soup and toasted cheese night. Sounds good for a frosty night, doesn't it? 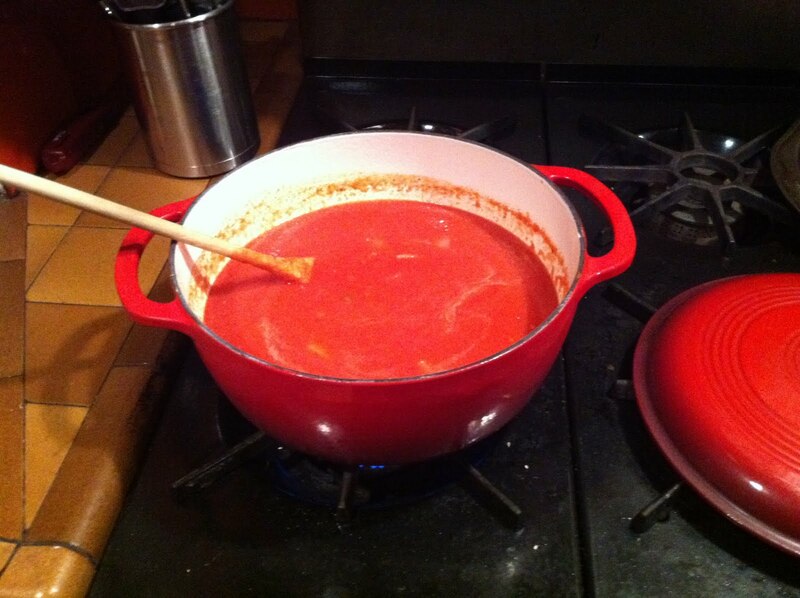 A few weeks ago I came across a blog, Bo's Bowl, that had what sounded like a really good tomato soup recipe. I know it doesn't sound like a big thing to you, but as much as I love tomatoes, I dislike two things: tomato juice and tomato soup. Crazy, huh? I like the idea of tomato soup, but have never been able to enjoy it where it didn't taste like I was eating runny marinara sauce. I've found the way to eat it - thanks Bo, whomever you are. You can go this above link to read or actually make the recipe yourself - you probably won't be sorry. Overall, except for the cup of cream, it's a pretty healthy food choice - I'm not sure how it would work with half-and-half, but that might help with a caloric intake. The title image is the soup without the cream, below is it with it added. The prep time is like 15 minutes. The cook time is only 20 or so. The puree/blend time is the longer process, but not long. If you read Bo's instructions, he says if you don't have an immersion blender (and I don't) that a regular blender is just fine, just not to fill it more than 1/3 of the way up, as hot liquid expands when blending. Heed this warning. I beg of you. I put just a smidge over a one-third in there and Ka-BOOM. Hot soup everywhere. Out of the blender, over my hands, across the island and all over the floor. Lesson learned. So to be conservative, I just blended two ladles full at a time, so it took longer, but no more soup explosions. If I had to do anything differently, I also played safe the jalapeno pepper. The recipe calls to leave in the seeds for greater heat. I left some seeds in, but not many. And the soup had some spice to it, but more seeds would have made it better - and hotter. I guess you have to figure what you can tolerate in the heat index. I also did minimal pureeing. I didn't want the soup too smooth. I like it with the more rustic consistency. I mean it wasn't chunky or anything, but it wasn't Campbell's either. And it went well with some good Italian bred and then slicing some good Swiss cheese and grilling that up. I suggest heartier croutons too. I just used some that we had for salads and they went way mushy almost upon hitting the liquid. They didn't stand-up they way one would like, but live and learn. Oh and the recipe doesn't say how many servings it makes, but I'm thinking we could have had a party for six folks to serve this much soup. We have a bit to use up over the next few days or so. Bo has some decent recipes on his site, and I can see myself going back there for more. I can see myself maybe even blogrolling him, mostly for my own convenience when looking for something new to make. So one of those goals for 2011 that was in my meme a few days ago, about cooking more - I'm on the road to doing that. Well, someone has to cook, I suppose. My older sister and I did not get that gene. My brother Bo—not that one—is an excellent cook and really enjoys it. I wonder why. Luckily, it skipped a generation and my daughter loves to customize recipes. The soup looks good. 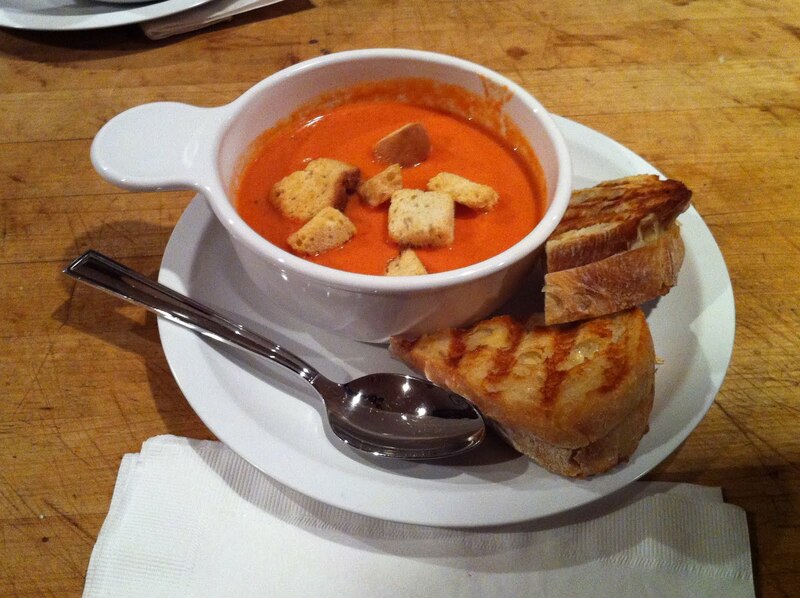 I love tomato soup but rarely have it. I may have to stalkerize you and make this recipe myself. Did the blending make it super-foamy? Did you have to wait for the bubbles to go down before you could eat it? Wild twist on the liking of tomatoes....my hubby can't stand tomatoes but love the soup! And salsa. It looks delicious...and perfect for this time of year. It may be my favorite food. 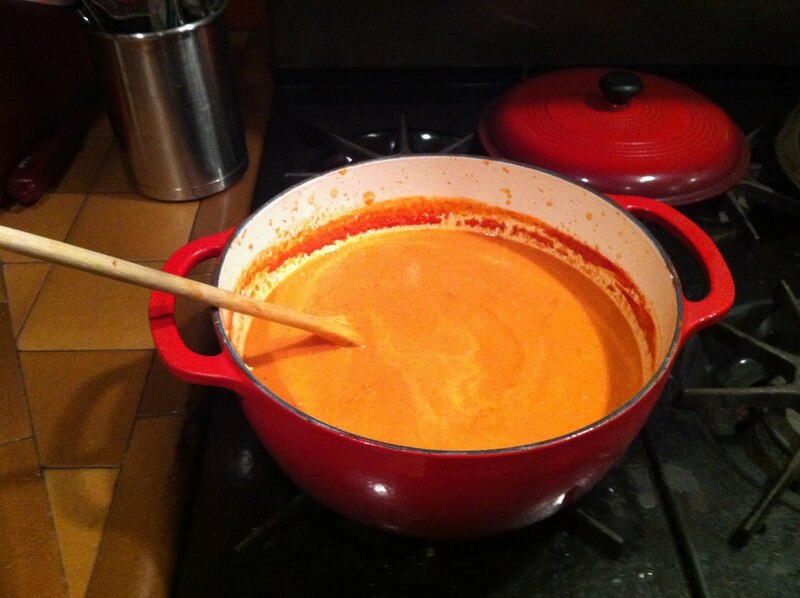 Every year I vow to make a new soup every month. Alas, it is hard to make a small amount ; I am the only one who would eat it. WTF, you get 4 comments on soup in a blender... I got nothing. Must be the GR mourning period sympathy. Not so crazy. I'm like you. I love tomatoes (although I am very picky about the quality if them) and tomato sauces and salsa and all that. But I have never been able to stomach more than a few spoonfuls of tomato soup. Don't even get me started on tomato juice. Maybe I will try this recipe. But cut in half in case I don't like it.